Your Local Dentist Says Flossing Does More Than You May Think! In an attempt to maintain your oral hygiene, you are sure to brush at least two times a day. Thus, you feel confident that you have really clean teeth, but is that the case? Your local dentist is weighing in to explain the benefits of flossing and how it does more than just clean food out of your teeth. Read on to learn how it factors greatly into your preventive care. Contrary to some beliefs, flossing does far more than just remove food from your teeth. Instead, it is just as important as toothbrushing when it comes to maintaining your oral hygiene and protecting you from bacteria growth. That’s because brushing can only address 60 percent of the surface of your teeth. The remaining tight spaces are perfect for bacteria to gather and grow without interruption, and the only way to clear them away is with flossing. How Does Flossing Protect Your Oral Health? Remove 18 to 24 inches from your dispenser and wrap it around your index fingers. When descending between the teeth, carefully move the floss side-to-side to prevent any gum irritation. To clean a tooth, form a ‘C’ shape with the floss and gently work up using the same back-and-forth motion. Before descending again to clean the next area, be sure to use a clean part of the floss. Initially, you may notice some bleeding, but don’t be alarmed. Your gums will soon adjust. Are There Aesthetic Benefits of Flossing? Fights Tooth Decay – As we’ve already mentioned, flossing is essential in fighting tooth decay, but through its proficiency in doing so, it also contributes to maintaining a beautiful smile. That’s because decayed teeth eventually show signs of the bacteria growth. Fights Stains – If you want to enjoy some foods or beverages that you know are more likely to stain your teeth, you can brush and floss afterwards to prevent the stains from settling on your teeth. Flossing plays a huge role here because the area between your teeth can become discolored and create smile flaws. 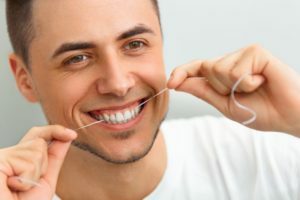 Once you start incorporating flossing into your normal oral hygiene regimen, you can rest assured that the health and look of your teeth will skyrocket. To learn more about how to protect your oral health, reach out to your dentist to schedule a consultation. A graduate of the University of Minnesota School of Dentistry, Dr. Melanie White has been delivering expert care for over a decade. With a diverse background of practicing in different environments, she is fluid in her care and able to assess complex issues. Dr. White practices at Maple Grove Family Dental and can be reached for more information through her website. Comments Off on Your Local Dentist Says Flossing Does More Than You May Think!